A two day National workshop on " on imagining- The future of the Space Science and its strategic importance, scheduled for 11-12 Oct, 2018 organized by Department of Physics and Astronomical Sciences, Central University of Jammu commences today in the premises of the beautifully equipped campus of CU Jammu. This conference is sponsored by Indian Space Research Organization (ISRO), Department of Space, Govt. of India. During the inaugural function, Hon’ble Union Minister of State, Dr. Jitendra Singh was the Chief Guest, Chairman, ISRO- Dr. K Sivan Guest of Honor and Former Chairman ISRO & Member of Executive Council CU Jammu- Dr. K Radhakrishnan CEO & Chairman J & K Bank- Jenab Parvez Ahmed were the Special guests. Hon’ble Vice Chancellor- Prof Ashok Aima, presented the academic and research activities of the University and welcomes the guests. He deliberated the importance of sciences and technology in various field including space science, material science, health and medicine, etc. In his welcome address, he emphasized that workshop of such nature provides a great opportunity for the scientific community, not only to update knowledge and keep abreast with the latest developments in the field of space science, but also an occasion for the invited speakers, delegates and participants to exchange ideas and interact with each other. He also said that this will act as channel for creating an atmosphere which will encourage and inspire students and young researchers for their overall academic growth. Dr. K. Radhakrishnan in his address encouraged the faculty members, participants and students to think out of box and find the multiple alternative solutions rather than their conventional one. He also appreciated the efforts of faculty members and Organizing Committee for the events for making this a great technical event for Central University of Jammu. Dr. K. Sivan in his talk highlights the importance of Space Science for mankind. He appraise the audience about the purpose of establishing the Satish Dhawan Centre for Space Science at Central University of Jammu- First kind of research centre in Northern region. The objective of this centre will be to develop a Centre of Advance studies in space sciences in J&K and Himalayan region, to promote the programme of space applications and to turn students into the future generation of leadership of high technology research and industry in India and abroad. Jenab Parvez Ahmed in his speech highlighted the importance of collaboration of Academics and Industry. He informs the gathering that J & K Bank have a close tie up for all higher learning institutes in Jammu and Kashmir. In his presidential remarks, Dr. Jitendra Singh congratulates Central University of Jammu for getting first Northern region’s Space Research Centre at CU Jammu. He also emphasized to maintain the top quality in the intake and training of the students without compromising the highest standard required for the space research. In his speech, he told that in spite of being son of soil, Dr. Satish Dhawan did not get due recognization in his own state for his immense contributions to the man-kind. By naming the Centre after his name, is a tribute from ISRO to the legend of Space research and a gift to people of Jammu and Kashmir. He praises the leadership of Sh. Narendra Modi, Hon’ble Prime Minister, for his scientific temperament and increasing the financial support to come with skill-devolvement and job-oriented courses. In the august presence of all the dignitaries, two Memorandum of Understanding (MoU) were signed. One was between Central University of Jammu and Indian Space Research Organization (ISRO) for establish the Satish Dhawan Centre for Space Science and Second one was between Central University of Jammu and Central Scientific Instrumental Organization (CSIR-CSIO), Chandigarh. On this occasion, Dr. H K Sardana, Officiating Director and Chief Scientist, CSIR-CSIO, Chandigarh highlighted the importance of high end instrumentation facility of CSIR-CSIO, Chandigarh. After MoUs, these facilities will be extended to faculty members and students of central university of Jammu. Prof. S. K. Khosa, chairman of the workshop, summarized the event and presented the vote of thanks. He expressed his sincere gratitude for financial support rendered by sponsor, J&K Bank and M/s Ramesh Traders Jammu. 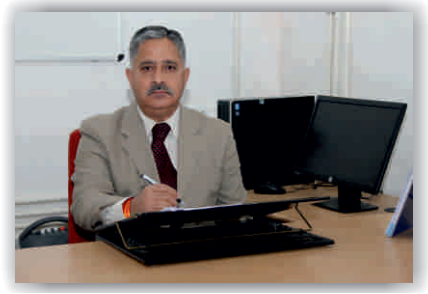 He expressed his sincere thanks to Dr. Vinay Kumar, Convener and HoD Physics and Astronomical Sciences, Dr. Avinash C Yadav, organizing secretary, Dr. Amit Tomar, co-convener, Dr. Suram Singh and Dr. Jehova J L Hmar, Joint Secretary, CU Jammu for their untiring efforts and support in organizing this workshop and MoU ceremony.